You guys…I have seriously fallen in love with tacos. But, not traditional tacos with the crunch shell. Sure, those are good too but I’ve been using naan for my “shells” and it has been a total game changer for me. Now, I am excited for Taco Tuesday each and every week. 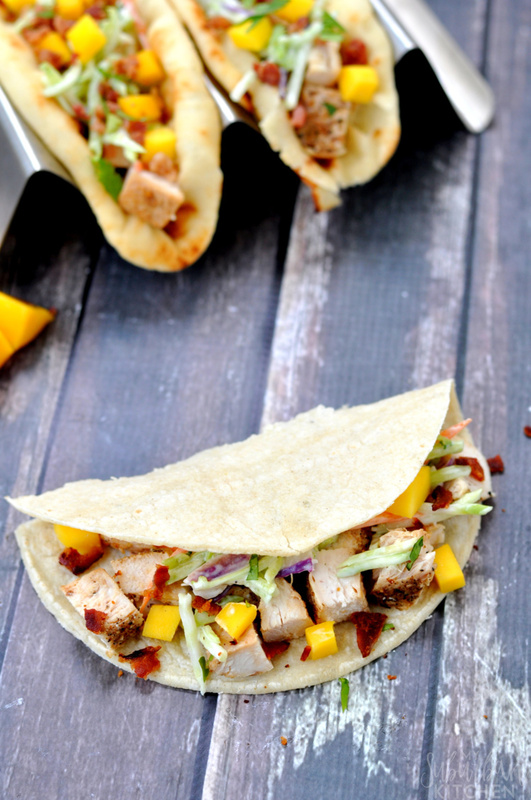 Last week, we had chicken bacon mango tacos and OH YUM! The mini naan I found at the store is the perfect size for a light and fluffy wrap for my tacos. I combined grilled chicken that was seasoned with fajita seasoning with crumbled bacon, chopped mango and a delicious southwestern ranch slaw. My family still asks for regular taco shells on occasion so I do still buy those. But, our new favorite is definitely a soft flatbread or naan. 1. Season chicken breast with fajita seasoning. Heat oil in medium skillet over medium-high heat. Cook for 5 minutes on each side. Reduce heat to low and cook until done; about 4-5 minutes. Transfer to place and cut into small pieces or shred. 2. In a small bowl, combine broccoli slaw and ranch dressing. Stir to combine. 3. Divide chicken between naan or taco shells. 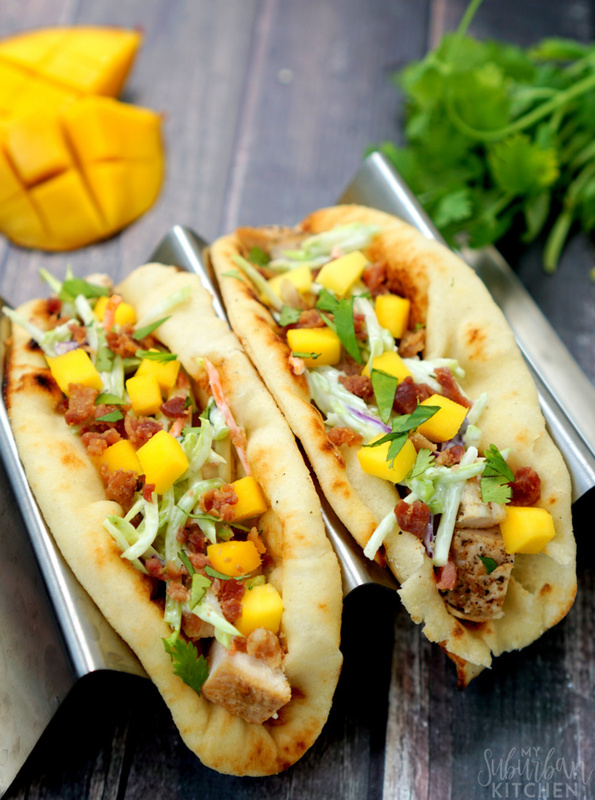 Top with mango, bacon, slaw and chopped cilantro. I always make an extra chicken breast and use it, along with the other half of the mango in a salad for the following day. The chicken, mango and bacon combination is so good. What are some of your favorite taco combinations? Have you tried using naan or other sorts of things in place of regular tortillas and taco shells? Season chicken breast with fajita seasoning. Heat oil in medium skillet over medium-high heat. Cook for 5 minutes on each side. Reduce heat to low and cook until done; about 4-5 minutes. Transfer to place and cut into small pieces or shred. In a small bowl, combine broccoli slaw and ranch dressing. Stir to combine. Divide chicken between naan or taco shells. 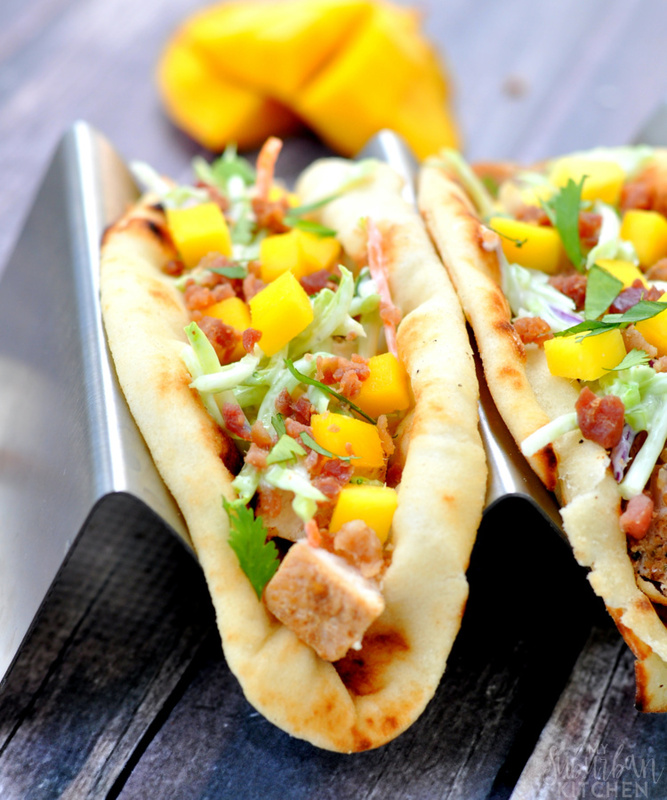 Top with mango, bacon, slaw and chopped cilantro.